Here are 5 exciting and kid-friendly activities you can partake in during your family vacation in Cabo San Lucas! As one of Mexico’s premier travel destinations, Cabo has a number of amazing activities to offer and scenic sights to see. Though Cabo is commonly known as the place for college students and adults to party, it is also home to a number of breathtaking natural wonders, outdoor hotspots, and family-friendly things to do. Here at Cabo Adventures, we are proud to offer a myriad of tours designed for travelers of all ages — kids included! In this guide, we discuss 5 things do in Cabo with kids and provide links to some of our most popular kid-friendly Cabo adventures. Read on for more information, and book with our award-winning tour team today! Located just south of Cabo San Lucas at the southernmost tip of the Baja California Peninsula, Land End is a national park unlike other. As the meeting point for the Pacific Ocean and the Sea of Cortez, Land’s End has an extensive array of marine life ranging from dolphins and seals to tropical fish, sea turtles, and more. Land’s End is also home to “The Arch,” a famous stone archway that travelers can swim under during their visit. Join our expert guides here at Cancun Adventures for an all-ages snorkeling experience at Land’s End, and experience marine wildlife and natural geology at one of Mexico’s most breathtaking national parks. Among the many species of marine wildlife located in the waters around Cabo, few are more spectacular than the region’s humpback whales. These gentle giants migrate to Cabo’s ocean waters during the months of November and December. During these times, they can be seen swimming and breaching just offshore. 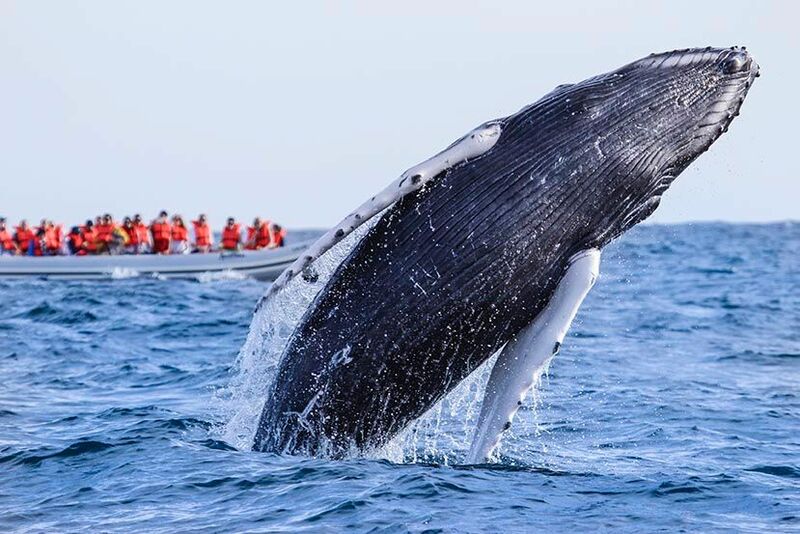 On our Whale Watching Cabo Photo Safari here at Cabo Adventures, our expert tour guides take you on a short boat ride to the whales themselves, so you can snap up-close photos and make memories to last a lifetime. Kids and adults alike will marvel at the majesty and sheer size of these creatures as they swim and breach just feet from our boats. Seeing marine animals in their natural habitats is exciting — but swimming with them up close and personal is the experience of a lifetime. Here at Cabo Adventures, we’ve partnered with Cabo Dolphins, the region’s award-winning marine center, to give visitors a chance to interact with marine mammals like never before. Swim with dolphins and meet sea lions on our Swim & Ride Experience or our Dolphin Kids tour. Want to learn what it’s like to work with dolphins? Join us for our Dolphin Trainer for a Day experience, where you’ll get to spend a day in a dolphin trainer’s shoes! These once in a lifetime tours are great for kids and adults who love marine mammals. Looking to explore more of the waters around Cabo? Set sail on one of our many sailing tours here at Cabo Adventures! Led by experienced sailors on cutting-edge vessels, our sailing tours take travelers to some of Cabo’s most exclusive locations, including hidden beaches, islands, and more. Some of our most popular Cabo sailing tours include our Luxury Day Sailing Los Cabos Tour, Sea of Cortez Wildlife and Snorkeling Adventure, Cabo Private Luxury Sail, and more! Great for the whole family, our Cabo sailing tours are the perfect way to see Cabo in style! Sure, the ocean is a big attraction in Cabo — but it’s definitely not the only thing going on in the area. Journey to the region’s interior for adrenaline-pumping experience on our Cabo ATV Tour Off-Road Adventure here at Cabo Adventures. On this fast-paced, land-based tour, kids and adults get to ride their own Polaris ATVs through rugged terrain in the hills, canyons, and wetlands just outside of Cabo San Lucas. Our experienced guides will provide information on the region and will help you to enjoy the ride at your own pace. Whether you’re looking to get your heart racing or simply enjoy a nice leisurely ride, this is the perfect outdoor adventure for you! Learn More and Book Your Kid-Friendly Cabo Adventure Now! Interested in getting more information on kid-friendly things to do in Cabo? Ready to book your next Cabo Adventure? Explore our website here at Cabo Adventures to learn more about our many award-winning Cabo tours, and contact our team directly for travel and booking information!